Recoveries of ringed birds tell us a great deal about the biology and ecology of particular species. When sufficiently large numbers of recoveries have accrued, they show that species’ normal pattern of movement and longevity. 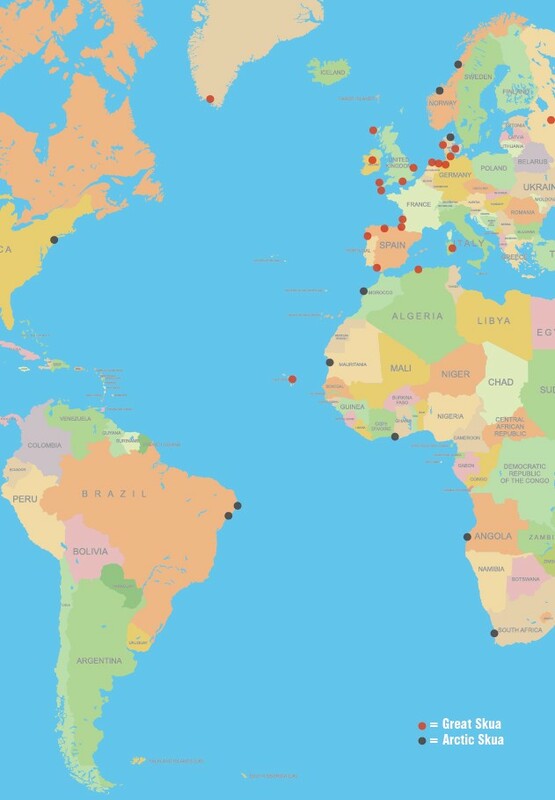 The map showing the recovery localities of Great and Arctic Skuas is a good example of this, with Arctic Skuas moving down the west coast of Africa, occasionally as far as the Cape but with occasional birds crossing the Atlantic to winter off Brazil, and Great Skuas staying rather closer to home, mainly wintering south to Iberia. From April to June and August to October, the wardening team aims to complete a full daily census of the migrants passing through Fair Isle. The island is divided into three (north, south west and south east), with wardens following a set route through each census area and recording all sightings. All areas are covered at the same time each day, normally over a four hour time period, to minimise the duplication of sightings and allow between-year comparisons of records, resulting in a data set stretching back over fifty years that provides valuable information for researchers. In addition to the census data, visitors are encouraged to contribute to the record of migration through Fair Isle by submitting their own sightings at Log, held every evening in the Observatory lounge. In order to find out more about birds (and a better understanding helps to conserve threatened populations), it is very useful to be able to recognise individuals. We can do this by fitting an alloy (non-corrosive) ring bearing a unique number and a return address. The rings are very small, roughly equivalent to a human wearing a watch. The details provided by the finders of a ringed bird are collated centrally so that the information can be shared. Marking individual birds helps to tell us about the movements and migrations of birds – where they breed, where they spend the winter, and what routes they take (and thus what hazards they encounter) on migration. 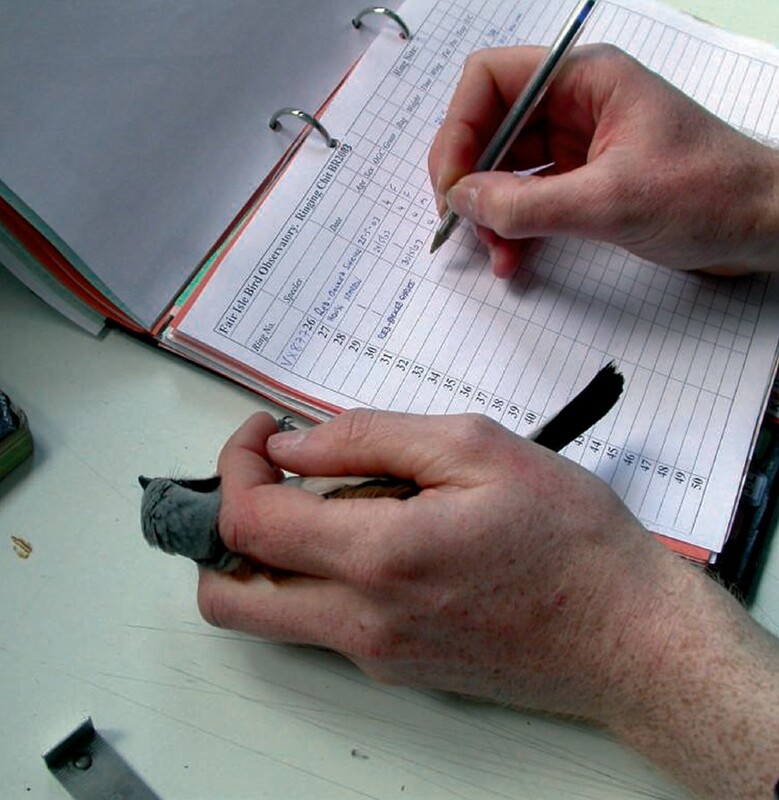 Ringing can also tell us much more about the daily lives of birds – about aspects of their behaviour, their breeding success, population trends and longevity. The most common way of catching birds in Britain is by a mistnet - a very fine nylon mesh net slung between two poles - which is near-invisible to birds if sheltered from the wind. 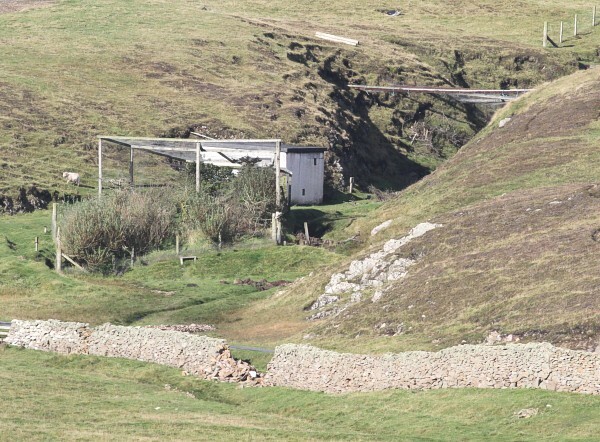 Unfortunately, because of the weather in Shetland and the lack of tree cover, mistnets are rarely practical (except in the relatively sheltered Observatory garden, if the weather permits), and most small birds on Fair Isle are caught in heligoland traps (developed on the German island of Helgoland, where there is another very famous bird observatory). 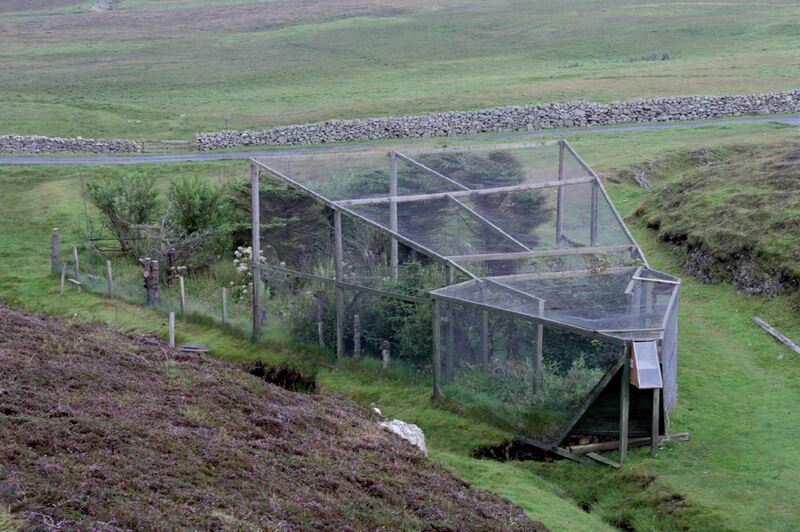 These are large, permanent, funnel-shaped traps, which allow birds to be caught safely in most weather conditions. However, one of their drawbacks is the amount of maintenance needed after winter storms. Between eight and ten heligolands have been operated by the bird observatory staff every migration season for over 60 years. 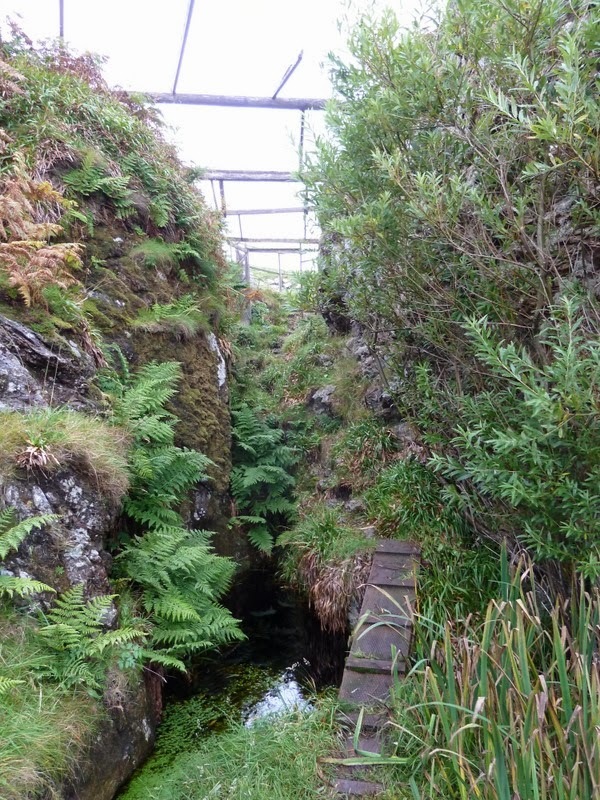 Although every single trap has a long list of ‘good’ birds caught in it, the jewel in the crown is the amazing Gully trap, perhaps the most impressive trap anywhere in western Europe, and which spans one of the arms of the gully at Finniquoy. 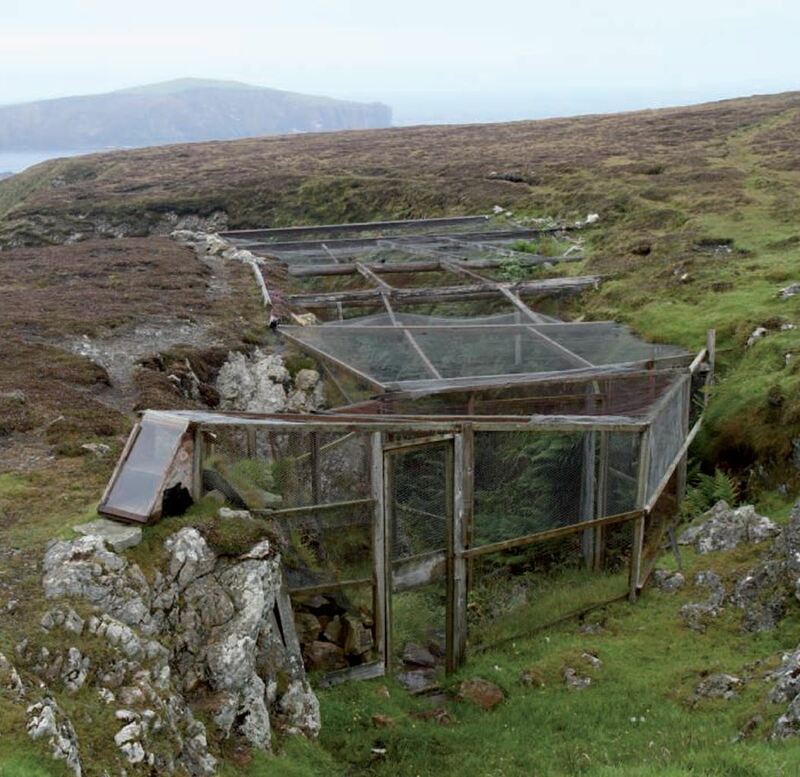 Five older traps no longer exist, or are no longer used (Auld Haa croft, Ward Hill, New Mill and old Observatory Trap). Visitors to the Observatory are encouraged to join a staff member on the first round of the traps each morning before breakfast. In all forms of catching, the safety of the bird is the most important consideration, besides which there is simply no point in catching birds if they are harmed in anyway, since the results would be biased and invalid. Ringers go through an intensive training programme before they are licensed to operate nets or other traps and to handle birds. Licensing is carried out by the British Trust for Ornithology on behalf of the UK Government. Typically, a high proportion of the birds ringed on Fair Isle each year are seabirds. Most of these are ringed as chicks, which do not require intricate or cunning means of capture since they cannot fly! Here, the difficulties involved relate much more to actually getting to the colonies, whether by small boat or down the cliffs. Once again, the birds’ safety is paramount, and ringers are careful to minimise disturbance to the colony. 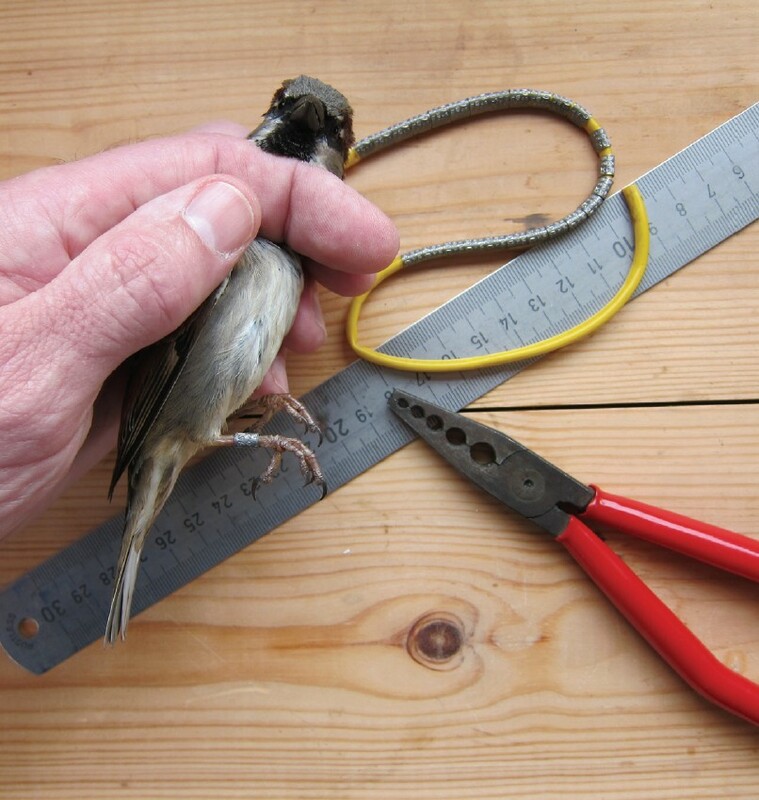 Ringing was developed early in the 20th century, and yet the rings that we fit to birds nowadays are actually very similar to those used in the early days. There has been some progress with the use of different metals, however, to make the rings more resistant to corrosion (particularly important for long-lived seabirds, especially the smaller ones such as storm petrels), but perhaps the main development with ringing in recent years is the use of computerisation to maximise (and speed up) the benefits of data collection as well as to improve catching technologies. Recently, the use of data loggers (using GPS) and satellite transmitters is revolutionising what we are able to learn from marked birds. As the process of ‘miniaturisation’ of the units continues to improve, increasing numbers of species are being fitted with these units - and as costs come down, it also becomes economically more feasible to carry out the work. So far, just a handful of seabirds from Fair Isle have been fitted with GPS loggers, but this technique is certain to expand. While the scientific purpose of ringing is to inform us of what is the norm, all ringers hope that one of ‘their’ birds might make an unusual and exciting journey. 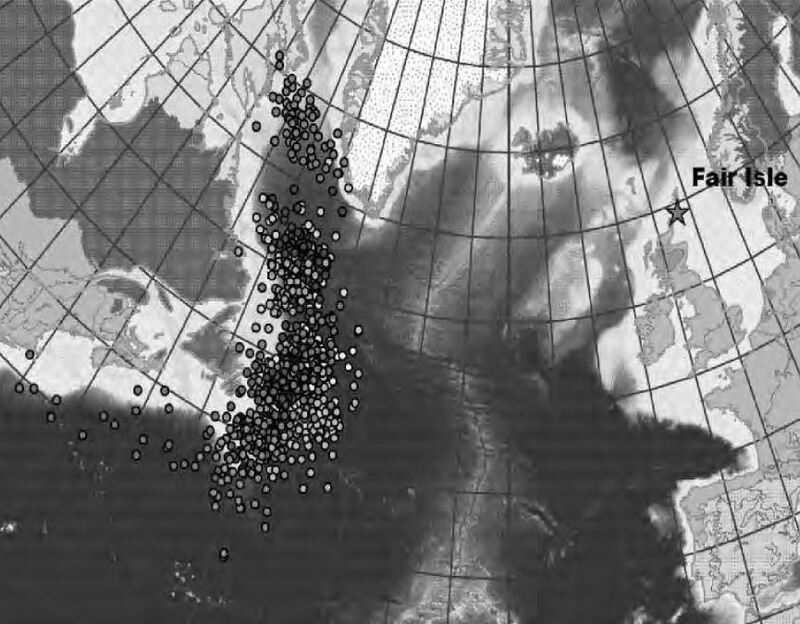 Some of the most spectacular of those involving Fair Isle birds are shown on the accompanying map. The American Wigeon had been ringed as a duckling in New Brunswick, Canada, and was caught on Fair Isle only a month later (and shot in Ireland two months after that!). By contrast, the Long-tailed Duck was caught on the Isle in October 1967 and recovered in Finland 20 years later. The Rustic Bunting recovery in Greece shows that it may be possible for some vagrants to re-orientate and go some way to getting back on course. The Snow Bunting probably did not make the Atlantic crossing that the map indicates. It was trapped in April on Fair Isle, probably on its way back to Greenland to breed. In the following spring, it was found in Newfoundland presumably having wintered that year in North America rather than Europe. The extent to which Fair Isle lies on a migration crossroads is highlighed by this map taken from the BTO website. 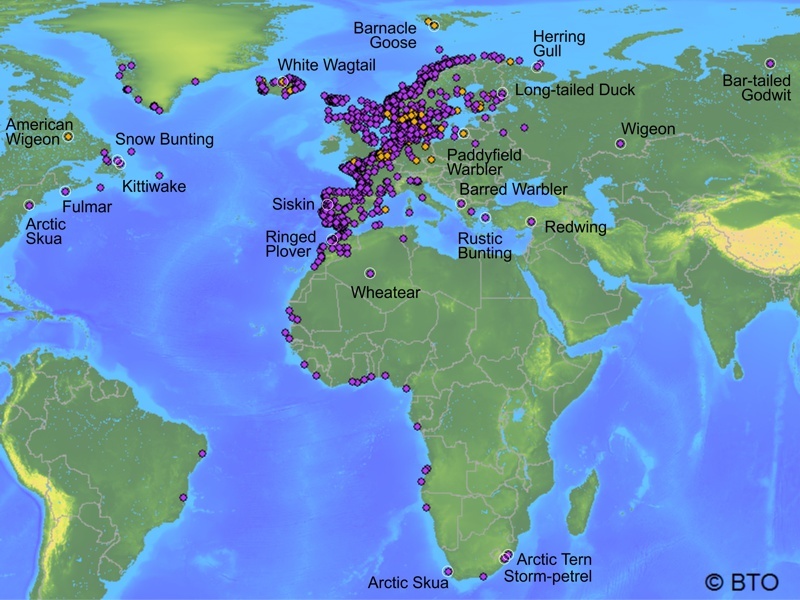 It plots all recoveries of ringed birds that have moved to (orange) or from Fair Isle (purple). For clarity, recoveries in the UK & Ireland are not shown. Sourced in April 2015. The island is divided into three census areas which are covered systematically each day during the migration season. Looking down on the Plantation Trap, 2010. The first plantation on this site dates from c.1960 and was expanded in 1998. It has recently suffered badly from wind blow. The Gully Trap lies at the head of Finniquoy, 2010. A group of Kittiwakes breeding on Fair Isle in 2009 were fitted with tiny data-loggers. The results obtained showed that they spent the winter on the other side of the Atlantic, in the Labrabor Sea, from New York north to Baffin Island. A paper about this project can be found in the journal Diversity and Distributions.